The dog days of summer will be here before you know it. If you recently replaced your old AC unit with a new, energy-efficient system, you can relax and enjoy a comfortable home and lower utility bills. If you’re one of the millions of homeowners with an older system, you may be faced with a tough decision – whether to replace or repair your AC unit. Here are some things to consider when deciding. The answer depends on a number of things, including the type of system, the overall quality of the components, how much the system is used, the local climate, and whether the system is properly sized, installed and maintained. 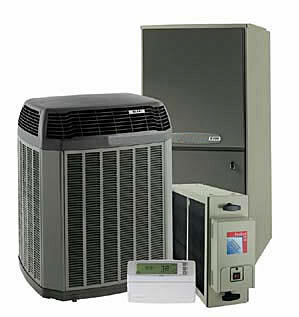 Central air conditioners come it two varieties – split systems and packaged units. Split system central air conditioners feature a metal outdoor unit that houses the compressor and condenser and an indoor unit that contains the evaporator and furnace or indoor part of a heat pump. Packaged central air conditioning systems feature an outdoor cabinet which houses the evaporator, condenser, and compressor, which is typically placed on a concrete slab located near an exterior wall. They also typically include a natural gas furnace or electric heating coils. Packaged units are often used for small commercial buildings and mounted on the building’s roof. Supply and return ducts are run though the exterior wall or roof. Split systems are more energy efficient, but packaged units are a popular choice for homeowners with limited space. When purchasing a new AC systems, it’s best to go with the type that’s already installed in your home. On average, an AC unit from a reputable manufacturer should last between 15-20 years before needing to be replaced. Keep in mind that when it comes to AC systems, as with most other things, going for the less expensive option may save you money at the time, but can cost you in the long-run. The term of the manufacturer’s warranty is also a good indicator of how long the unit will last. The typical warranty for a name brand system will be anywhere from five to 15 years. It just makes sense that mechanical systems that receive more usage will require more maintenance and repairs and will need to be replaced sooner than those that are used less frequently. For example, homeowners in the southern U.S. tend to run their AC units on a regular basis from early May through mid-October while those in the Northeast and Midwest may only require air conditioning from mid-June through early September. In addition to temperature, humidity is another factor that can have a big effect on your AC system’s life expectancy. Air conditioners cool by removing heat and moisture from the indoor air, so higher humidity levels cause your home’s AC system to work longer and harder, thereby reducing its life expectancy. Most people mistakenly believe that larger, more powerful AC systems will always deliver better results. But air conditioners don’t just control temperature. They also control humidity. If your AC system’s capacity is too large for your home, it won’t have to run as long or as often to achieve the desired temperature, but not enough to adequately remove humidity from the air. When it comes to their cars, most people wouldn’t dream of skipping a recommended oil change. They understand that proper maintenance is essential to getting the most out of their vehicle. Unfortunately, too many people don’t see the correlation between proper maintenance and the life expectancy of their AC units. Most AC contractors recommend that you have your AC system inspected annually to ensure it is safe and working at peak efficiency. In fact, many manufacturers require routine inspections as part of their warranty agreements. Replacing your home’s AC system is an expensive proposition, but at some point you’ll have to “bite the bullet.” Here are some things to consider when weighing your options. Even if you’re not having to make frequent repairs, you may want to consider replacing your AC unit if it’s more than 10 years old. If your current AC unit is 12 years old or older, replacing it with a new Energy Star certified system could reduce your monthly cooling costs by as much as 30 percent according to the energystar.gov website. If you’re constantly having your AC unit repaired, it may be time to consider replacing it. Some heating and cooling contractors recommend using the “5,000 rule” to determine whether a replacement is warranted. The 5,000 rule multiplies the cost of a single repair by ten and compares it to the average cost of replacing the unit. For example, a $250 repair multiplied by 10 equals $2,500 which is only half of the average cost to replace the unit. If the repair cost multiplied by ten exceeds $5,000, it might be worth it to have the unit replaced. It’s also important to consider the type of repair. If your system requires frequent refrigerant recharges, the problem could be serious enough to warrant a replacement. Refrigerant leaks are among the most serious and expensive AC problems. Dee Murphy is the president of a heating and AC repair company in Fort Worth, Texas. She says Freon leaks are a particularly tricky problem, because customers sometimes feel the repair technician is trying to convince them to buy a new system when all they need is more Freon. But R-22 Freon costs have skyrocketed in recent years, so repairing, and recharging a leaky system can cost hundreds of dollars. Freon leaks also tend to shorten the life of your compressor, which can cost upwards of $2,000. 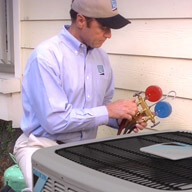 Depending on the severity of the leak, you may be better off replacing the faulty unit. Another thing to consider is how long you plan to live in your home. If you plan to sell it in the near future, you may want to leave it to the new owner to replace the old AC unit. On the other hand, a new system can be an attractive selling point that could potentially add thousands of dollars to your asking price. Don Williams is an online marketer based in the DFW area.